This excellent introduction to a great site was written by my friend Mark Robertson. Have a talk with him on Twitter @markosul. 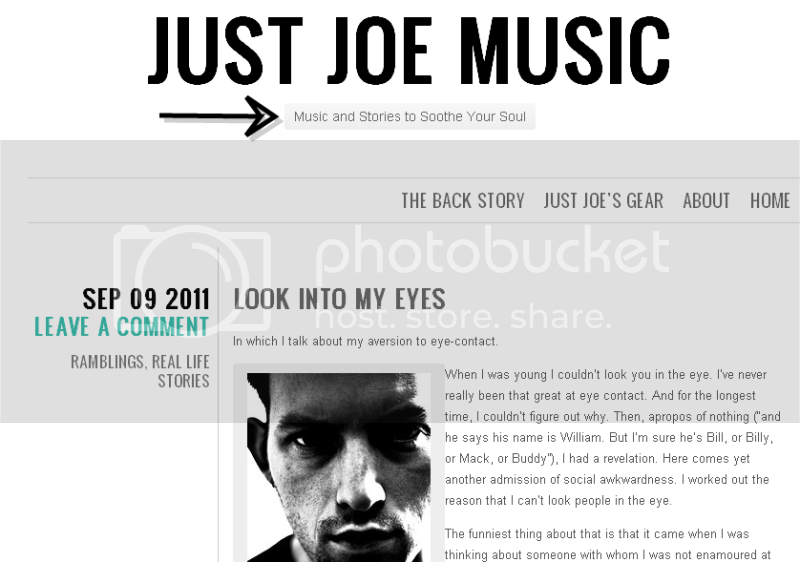 Joe Dixon, of justjoemusic, is a “musing muso,” who tells us about his life and experiences with references to songs. He also writes a letterly in which he explores the depth and breadth of a classic album; his writing has some technical language, but is focused on his experience in a life marinated in music. The work is credible. His words are underpinned with a deep, almost charitable love for music; his stories are elegantly threaded through sound, beat and lyric. Critics don’t do this. They “break the album” with a rating and highly-pretentious language that often distracts; critics from The Guardian and the A.V. Club, among others, use elegant prose, but I see their work as “implicitly autobiographical.” We learn more about what they can say about new music–how to categorize and how to create buzzwords. In a recent letter about Tool’s album Lateralus he explains some of the technical complexity (viz., 5/4 time signature), but focuses his attention on the way the music broke new ground in his sonic imagination. His most recent blog post is about eye-contact aversion and Billy Bragg. The reader feels an affinity to the experience and has a sense of the way music informs and resonates with our experience. It’s “music by numbers” but with none of the negative connotations. The only negative thing I can think about the album is the last track, “Faaip De Oiad” (Enochian for “Voice of God”) features a frankly terrifying (and not in a good way–a lot about Tool is terrifying in a good way) phone call made by a man to Art Bell’s “Coast to Coast AM” radio show in 1997.The call (later revealed by the caller to be a hoax) is from a man describing a series of ‘secrets’ he learned from his time working in Area 51. The first time I got that far in the album, I was listening to it on my iPod while my dad was driving us through France. I was dozing and woke up, just as we were driving into a tunnel, to the ranting of this man. It was an unpleasant experience which has made me reticent to listen that far into the album again. This would never be published by Pitchfork. But there is undeniable value in the way he uses music as a centerpiece for transmedia, storytelling, and personal experiences. This kind of “experience-telling”–if curated with fidelity–will slowly transform our “meta-tale” from a “blogosphere” to a digital fireside. A place to tell stories, share ideas, refine tools, and play songs. Thank you, Joe (@onlyjustjoe) for pioneering the latter.